Classic Film and TV Café: Happy 60th Birthday to "The 5,000 Fingers of Dr. T"
Happy 60th Birthday to "The 5,000 Fingers of Dr. T"
Dr. T instructs his "favorite" pupil on the mega-piano. Dismissed by critics and filmgoers in 1953, the wonderfully weird 5,000 Fingers of Dr. T has evolved into a classic fantasy favored by fervid fans. 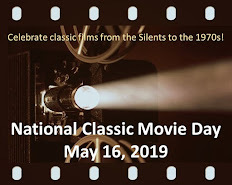 It also holds a special place in cinema history as the only film written by Dr. Seuss expressly for the screen (he penned the original story and co-wrote the screenplay). While some of his literary works boast mischievous characters (e.g., The Cat in the Hat), none of them compares to the delightful, dastardly villain of Dr. T-- a piano teacher who imprisons 500 children and forces them to play a giant piano ad nauseum. August the plumber and Bart hatch a scheme. Much of The 5,000 Fingers of Dr. T is presented as the dream of Bart Collins (Tommy Rettig), a young boy forced by his widowed mother to take piano lessons from the overbearing Dr. Terwilliker. In his dream--which comprises most of the movie--Bart transforms Terwilliker into the evil Dr. T, who has hypnotized Bart's mother and plans to marry her! 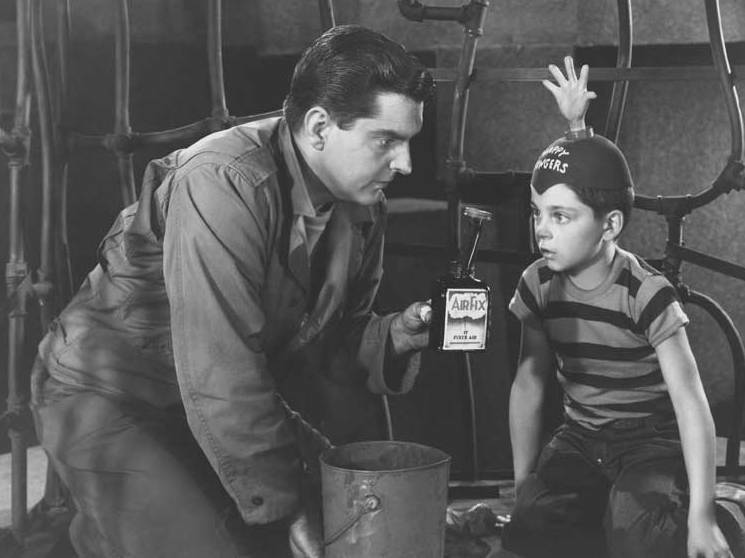 The young boy enlists the aid of plumber August Zabladowski (Peter Lind Hayes) and sets out to thwart Dr. T's despicable plans. Oh, did I mention that The 5,000 Fingers of Dr. T is a musical? Dr. T looking very royal! 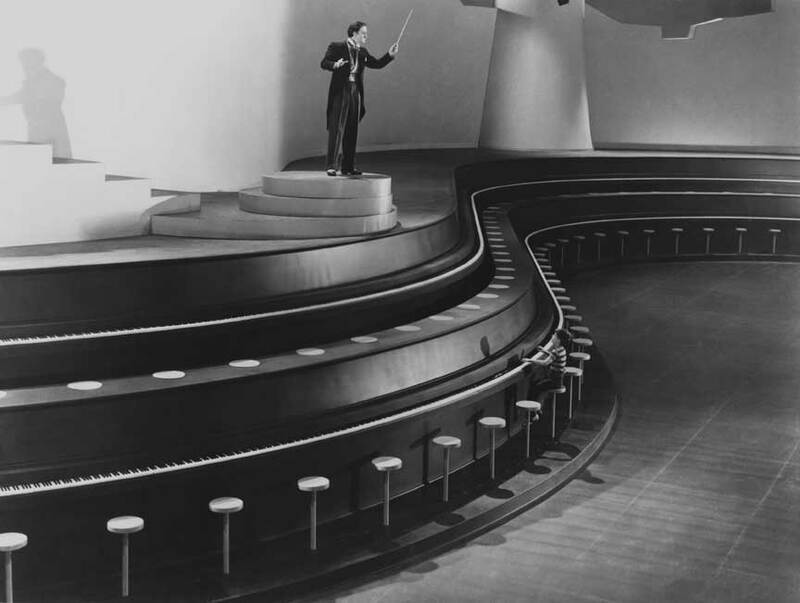 As in many of Dr. Seuss's children's books, the presentation matters more than the plot. Dr. T's nightmarish castle--which favors a purple, blue, and green color scheme--includes a giant harp, a hooded elevator operator that looks like an executioner, a pair of rollerskating twins who share the same beard, and, of course, that gigantic piano. Rudolph Sternad's colorful, expressionistic sets can be best described as The Cabinet of Dr. Caligari meets The Wizard of Oz. His work should have received an Academy Award nomination. Still, it was recognized where it mattered most--Sternad collaborated with producer Stanley Kramer on 21 films, including classics such as High Noon, Inherit the Wind, and The Defiant Ones. The elevator operator, Bart, and August. Hans Conried as Dr. T.
Yet, despite the stylish sets and memorable songs, the success of The 5,000 Fingers of Dr. T hinges on its villain, who must be threatening and fun. No one could play the role better than Hans Conried, a well-regarded stage actor whose distinctive voice breathed life into Captain Hook in Disney's Peter Pan and Snideley Whiplash on the "Dudley Do-Right" cartoons in The Rocky and Bullwinkle Show. Conried, who had a long, successful career in film and television, was also a member of The Mercury Theatre, the famous repertory stage company founded by Orson Welles and John Houseman. For many television viewers, though, Conried is best remembered as Uncle Tonoose on several episodes of Danny Thomas' Make Room for Daddy. 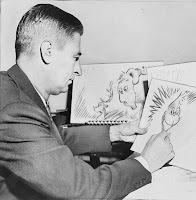 Ted Geisel and the Grinch. But for years, Ted grew grim at any mention of the film, and declined to list it in his official Random House biography. He called the making of The 5,000 Fingers of Dr. T the greatest "down period" of his career. "As to who was most responsible for this debaculous fiasco, I will have nothing more to say until all the participants have passed away, including myself." While no one can deny Dr. Seuss's talent as a children's author, film criticism apparently wasn't his forte. The 5,000 Fingers of Dr. T has exhibited an enduring appeal over the last 60 years. It has never achieved the mainstream success of Oz or Disney's fantasies, but its quirky look, delightfully odd songs, and the marvelous Hans Conried have made it a film to be treasured by children of all ages--even adults. The Sony Movie Channel is showing The 5,000 Fingers of Dr. T on Thursday, June 20th, at 8:15 P.M. and 11:40 P.M. All times are Eastern. Love "Dr. T" - great tribute, Rick. Dr. Seuss lived into the 1990s - and must've known by then that the movie was on its way to classic status. I hope so, anyway. I've always enjoyed this film and recently showed it to some friends of mine. They hated it. It's definitely quirky, and not built for mass appeal. What a terrific tribute to a fascinating cult film! It was especially interesting to read about Geissel's reaction to his work. I suspect he had a different vision in his mind's eye. I wonder if he would have preferred for this to have been animated? Hans Conreid certainly has an impressive resume for villains! This was an excellent review, Rick, and most cleverly written. I loved your alliteration in the first paragraph especially. Great job! Theodore Giesel's, dungeon number with the rejected players and their very strange instruments is a odd but funny, piece of choreography. I had not really planned on watching this film and even had my remote control in hand, but... could not seem to change the channel. This film will grab your attention and you will not soon forget watching it. IMHO.. A must see for Dr. Seuss fans. I dragged my sisters to see this movie on the big screen when it was presented by Cinematheque Ontario years ago. A giant Hans Conried slipping into his "Do-Mi-Do Duds" is quite a sight to behold. My husband calls this "The 5,000 Necklaces of Mr. T". I'm sorry to say that I hated this film as well, despite the impressive art design. In a weird way I think I really wanted to enjoy myself, but it just didn't happen. Perhaps as time goes on I will like it more, but for now it will have to remain one of those films that I appreciate for its influence without considering it great. Rick and friends, while THE 5,000 FINGERS OF DR. T may not be for all tastes, we of Team Bartilucci are proud to let our freak flag fly and proclaim our love for this magnificently deranged movie! It's a shame Dr. Suess himself wasn't happy with the result, but we've loved it for years; hey, can't please everyone! We especially love the nutzoid plot (who hasn't been frustrated while learning the piano?) and set design. Hans Conried, another longtime Team B. fave, especially cracks me up, especially in the "Do-Me-Do Duds" number! 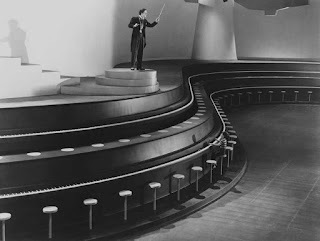 My dear late mom schooled me in the career of co-stars Peter Lind Hayes and Mary Healy, and Hayes' line "I am not a cog. I am an independent contractor" always cracks us up (the delivery really makes it). Thanks, Rick, for showing off ...DR. T here at the Classic film & TV Cafe! Do-Mi-Do duds is widely considered to be a paean to cross-dressing, as beloved as "little black dress" from Shock treatment. This is a fabulous surreal movie, and have loved from the first viewing as a youngster on Christmas. Hand Conreid is a beloved figure in our house, for his work with both Disney and Jay Ward. His mad voice always brings a laugh. Seek out a copy of The Twonky for another wacky surreal masterpiece. I love this one too. It is so "out there" that you have to go a long way to find anything that compares. However, it does violate one of the most time-tested rules of bad endings. It was all a dream. Why couldn't it have been real? Surely the great Dr Seuss could have come up with a plot that tied reality into fantasy? A story is completely invalidated when everything was only a dream. But that aside, it's still a great ride. I made my kids watch it when they were six or so, and they were mystified but fascinated. It helped that the main character had the same name as their daddy. The " Dungeon Song" , sung by that elevator operator has stuck with me over the years. 1st saw this around 1959 or so. Always waited for the elevator operators to break out in a song after that. Kinda scary when I was a kid..